The SpencerLab 2018 Report, which was commissioned by HP, is severely skewed since in-store refills and DIY (do-it-yourself) refills are grouped together. The in-store ink cartridge refill InkCenter® provides a far superior refill experience over DIY and all other refill solutions, since trained operators leverage a fully automated and computer regulated ink cartridge refill process. The InkCenter® equipment uniquely refills each ink cartridge via carefully timed ink fill and vacuum (air) pressure cycles (see 14 refill patents). While some cartridges may only take 2.5 minutes to refill, others like the more complex HP 95x sealed tank which has an internal foil bag and the Epson 2xx multi-chambered design, can each take up to 6 or 7 minutes to refill properly. With respect to HP page yields represented in the report as being approximately two times greater than its competition, this does not apply to InkCenter® in-store ink refills since an InkCenter® typically puts more ink in cartridges than does HP or other OEMs. The extreme page yield delta (i.e. 3X) between HP 62XL Original color ink cartridges vs. all the aftermarket cartridges is highly questionable. Upwards of 40 HP Envy and HP OfficeJet printer models appear to be impacted and there is no customer resolution available at this time. Claims of ‘printhead’ failures is considered a premature determination since initial microbanding can occur with any installed ink and largely depends on the quality of the refill, ink tank chip revision installed and printer firmware revision. Below we have provided a deep dive attempt to help explain the phenomena being reported in the study but it’s not something that our in-store ink refill customers readily observe; permanent microbanding is very rare. Unfortunately ongoing HP printer firmware updates (rollbacks) directly contribute to many of the observed issues on select tank-based printers (i.e. 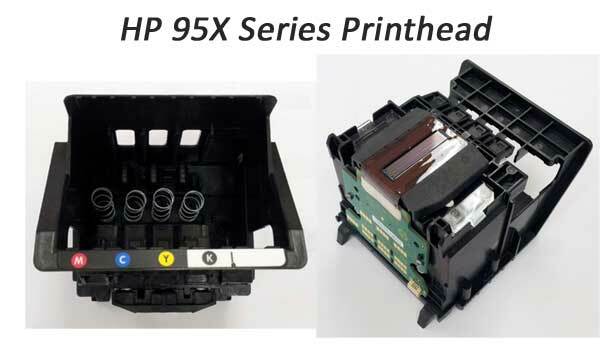 HP 564, 950/951, 970/971) since ink sensing circuitry can become confused leading to substandard print quality. The good news is that the combination of observed microbanding and/or ‘Ink System Failure’/’Printer Failure’ errors are typically recoverable the majority of the time. Following a 3rd party industry review inquiry in June 2018, SpencerLab admitted they air shipped all (or a portion of) the Costco/Fry’s refilled cartridges — this completely deflates/nullifies their test results! (refilled ink cartridges must only be transported via ground; shipping cartridges via air transportation requires specially ‘degassed’ inks or cartridge over pressurization and leaking will be usually be encountered). 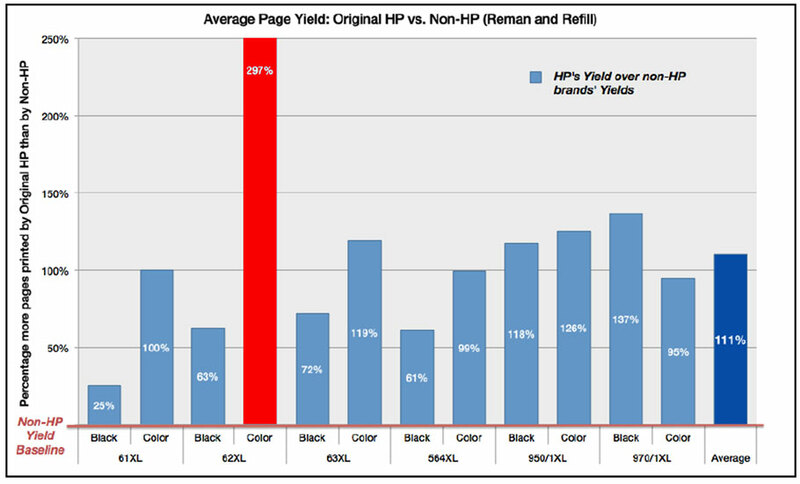 The HP 62XL color cartridge page yield results significantly favor HP (i.e. 3 times higher! – shown in red below). HP must have modified Envy and OfficeJet printers to yield 3X less color pages, on average, when any of the HP 62 aftermarket cartridges tested were installed. The variance between HP 62XL black and HP 62XL color (as compared to new HP Original cartridges) also illustrate that intra-page spitting was utilized. Our internal lab testing on HP Envy and OfficeJet printers reveal that HP performs extra ink depleting maintenance with aftermarket HP 62 color cartridges, resulting in a 3X-4X lower page yield, on average. For example, a HP 62XL color cartridge which would normally yield a ‘real world’ consumer page average of ~300-380 pages, will now only yield ~60-90 real world pages! Such gross results would highly discourage any customer from obtaining aftermarket HP 62 or HP 62XL color ink cartridges! NOTE: ISO/IEC 24711 internal laboratory testing yields 600 pages for HP 62XL black cartridge and 415 pages for the HP 62XL color cartridge, but unfortunately this is not real world since the testing is performed using a ~5% density black page and a 22.5% density 5-color page set. ISO printing is performed continuously until the ink cartridge is determined to be empty (testing does not account for in-between job printing and subsequent ink maintenance cycles which normally occur in the real world). Our ink labs thoroughly our test ink formulations for ‘on-par’ HP performance for at least 6 months prior to release to retail refill labs. All refilled cartridges include the latest ink tank chip revision to ensure flawless performance once received by the end customer. Our in-store retail service is intended for local area customers only; if any of the retail refilled cartridges were air-shipped to the SpencerLab NY test facility this would damage the refilled cartridge since retail refill inks are NOT degassed (degassing of inks is required for all ink cartridge air shipments to prevent leaking due to atmospheric pressure changes). NOTE: Our engineering test group have also periodically observed HP original ink cartridges with banding right out of the box while our in-store refilled inks did not exhibit any banding (i.e. HP 564 cartridges in several HP Photosmart 6520 printers during a recent May 2018 ink test). 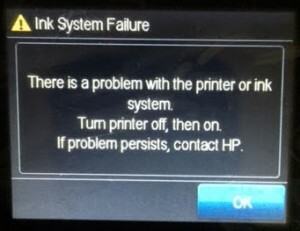 With HP’s move toward a much higher mix of built-in printhead based printers in recent years, ‘Ink System Failure’ & ‘Printer Failure‘ alerts have become commonly reported error conditions with tank-based printer systems (i.e. HP inkjet printers which use 4, 5 and 6 installed ink cartridges), primarily due successive waves of printer firmware updates (i.e. 2016 and 2017 firmware rollbacks) and corresponding ink tank chip version updates (via 3rd party chip vendors). 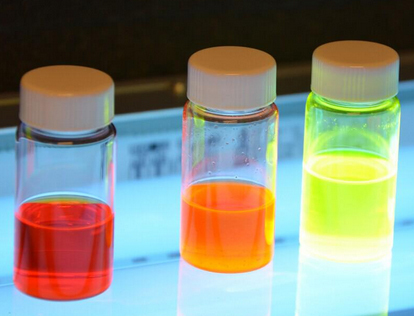 If ink sensing is incorrectly registered (i.e. with a refilled cartridge that is full) or if any air is ingested into the built-in printhead, either due to a partially refilled ink cartridge, it will typically result in the printer becoming confused due to the lack of ink within the ink sensing cavity. Under either scenario a printer alert message such as ‘Ink System Failure’ or ‘Printer Failure’ will typically be displayed. After these temporary error states are overcome (see resolutions below), follow-on microbanding or missing colors may then be temporarily observed. In the majority of consumer cases, this does NOT mean the printhead assembly has actually failed. If the customer verifies all the ink cartridges have an adequate supply of ink (30% minimum) and new chips are installed and activates a ‘printhead clean’ via the maintenance menu 1-2 times, this will typically correct the error condition most of the time (i.e. 99%) and normal printing operations may resume. It appears that HP is attempting to take advantage of minor print quality issues (which also occurs with brand new HP original ink cartridges!) in an effort to scare end-consumers and re-spread the propaganda rumors that aftermarket inks damage printers/printheads, just like Epson did oh so many years ago – this is simply not true*. On the other hand if a ‘Printhead Failure’ alert is observed then this is usually an internal electrical failure of the printhead; though it is first suggested to remove the printhead and clean all electrical surfaces and retest before making this assumption. *The only exception would be those rare inks which contain ~5% or more VOC content (volatile organic compounds) or dye sublimation-based inks. While a high VOC content is common for many Wide-Format Solvent ink printers which leverage high-quality piezo printheads to print on uncoated media (and can typically handle upwards of 5-18% VOCs), such a high VOC mix can rapidly deteriorate a low-cost/consumer level inkjet printer printhead due to internal failure, delamination, etc. To learn more about consumer inkjet printers and the operational differences, refer to our ‘What is Ink’ and ‘Multiple Cartridge Printer Systems’ support pages.